The Wells Fargo Business Elite currently has an Informr score of 7.9 out of 10. This score is based on our evaluation of 2 sources including reviews from users and the web's most trusted critics. Wells Fargo Business Elite is typically available to those with excellent credit scores (650 or greater). 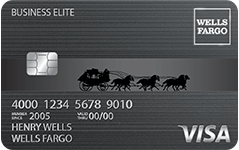 The most valuable aspect of the Wells Fargo Business Elite Card is the control it affords businesses over their credit card accounts—specifically in regards to employee card usage. However, companies that are more interested in earning rewards with their cards will likely have better options. The card itself isn’t worth keeping long term as there are lots of other cards with no annual fee that earn at a higher rate than 1.5% cash back but this could be a good option for businesses with $1 million+ in sales to just get the sign up bonus. Choose your rewards program between cash back and reward points. - Receive 5,000 bonus points when your company spend reaches $10,000 in any monthly billing period. - Get a 10% bonus when you redeem points online. - Earn extra bonus points or discounts from Earn More Mall retailers.